Vellum! It can't be denied it's the popular new trend and you can see why. 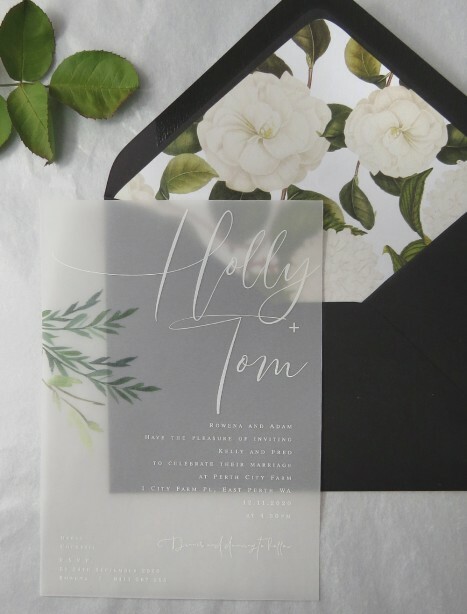 So stylish and sleek - the transparency adds a true romance to your wedding stationery with a modern edge. Teamed up here with a black envelope and marble liner - the effect has such a lovely soft edge with this modern design. But dramatically change the vibe by having fun and choosing your own liner and envelope colour. It looks so great with greys, greens, blacks or blush! Please note that the liner is an added extra with this wedding invitation, it is not included in the price here - you can purchase these seperately under the extra wedding stationery section. If you'd like a different coloured envelope please pop your choice in the check out box! We can match this stunner up with any extra items, wishing well, rsvp etc so please ask us for any more info you might need! Please note the sizing is 121 x 171.8mm and the vellum is a premium quality at 180gsm so it feels lusciously thick and sturdy.